The Global Volcanism Program has no activity reports for Cerro Santiago. The Global Volcanism Program has no Weekly Reports available for Cerro Santiago. The Global Volcanism Program has no Bulletin Reports available for Cerro Santiago. A cluster of cinder cones and low shield volcanoes surrounds the city of Jutiapa in SE Guatemala. The most prominent feature is Cerro Santiago, one of two coalescing cinder cones capping a low shield volcano SE of the city. Youthful flows from the twin Los Cerritos cones NE of Jutiapa cross the Interamerican highway. Volcán Culma forms a steep-sided basaltic lava mound immediately E of the city. To the W lies Cerro Gordo (referred to by Williams et al., 1964 as Volcano Amayo), a craterless cinder cone surrounded by basaltic lava flows. It is one of several cinder cones to have produced lava flows that blanket the landscape between Jutiapa and Tertiary volcanic hills to the S.
The Global Volcanism Program is not aware of any Holocene eruptions from Cerro Santiago. If this volcano has had large eruptions (VEI >= 4) prior to 10,000 years ago, information might be found on the Cerro Santiago page in the LaMEVE (Large Magnitude Explosive Volcanic Eruptions) database, a part of the Volcano Global Risk Identification and Analysis Project (VOGRIPA). There is no Deformation History data available for Cerro Santiago. There is no Emissions History data available for Cerro Santiago. A cluster of cinder cones and low shield volcanoes surrounds the city of Jutiapa in SE Guatemala. This photo shows Volcán Culma, a lava cone composed of coarsely porphyritic basaltic lavas on the eastern side of the city. 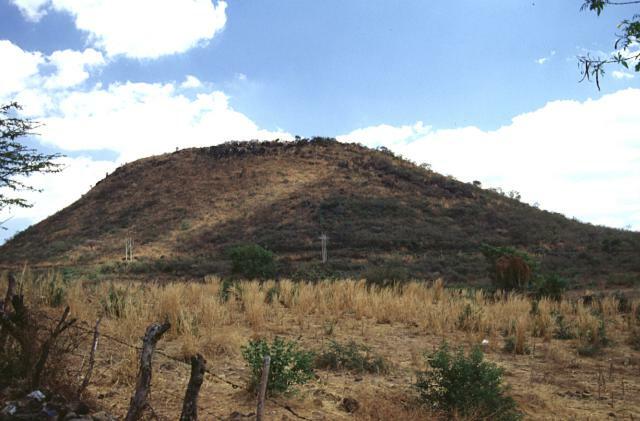 The most prominent feature of the volcanic field is Cerro Santiago, one of two coalescing cinder cones capping a low shield volcano SE of Jutiapa. This photo was taken from the Pan-American highway, which here is underlain by youthful flows from the twin Los Cerritos cones NE of Jutiapa. There are no samples for Cerro Santiago in the Smithsonian's NMNH Department of Mineral Sciences Rock and Ore collection. Large Eruptions of Cerro Santiago Information about large Quaternary eruptions (VEI >= 4) is cataloged in the Large Magnitude Explosive Volcanic Eruptions (LaMEVE) database of the Volcano Global Risk Identification and Analysis Project (VOGRIPA).